For Japan's Imperial Regalia, see Imperial Regalia of Japan. For Brazil's Imperial Regalia, see Imperial Regalia of Brazil. The Imperial Regalia, also Imperial Insignia, (in German Reichskleinodien, Reichsinsignien or Reichsschatz) are the regalia of the Emperors and Kings of the Holy Roman Empire. The most important parts are the Imperial Crown, the Holy Lance and the Imperial Sword. Today they are kept at the Imperial Treasury in the Hofburg palace in Vienna, Austria. The Imperial Regalia are the only completely preserved regalia from the Middle Ages. During the late Middle Ages, the word Imperial Regalia (Reichskleinodien) had many variations in the Latin language. The regalia were named in Latin: insignia imperialia, regalia insignia, insignia imperalis capellae quae regalia dicuntur and other similar words. The regalia is composed of two different parts. 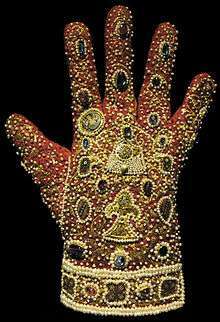 The greater group are the so-called Nürnberger Kleinodien (roughly translated Nuremberg jewels), named after the town of Nuremberg, where the regalia were kept from 1424 to 1796. This part comprised the Imperial Crown, parts of the coronation vestments, the Imperial Orb (a globus cruciger), the Imperial Sceptre, the Imperial Sword, the Ceremonial Sword, the Imperial Cross, the Holy Lance, and all other reliquaries except St. Stephen's Purse. 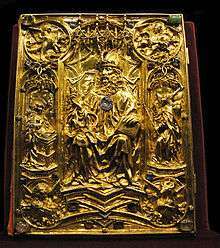 St. Stephen's Purse, the Imperial Bible, and the so-called Sabre of Charlemagne were kept in Aachen until 1794, which gave them the name Aachener Kleinodien (Aachen jewels). It is not known how long they have been considered among the Imperial Regalia, nor how long they had been in Aachen. The inventory of the regalia during the late Middle Ages normally consisted only of five to six items. Goffredo da Viterbo counted following items: the Imperial Cross, the Holy Lance, the crown, the sceptre, the orb, and the sword. On other lists, however, the sword is not mentioned. Whether the medieval chronicles really do refer to the same regalia which are kept in Vienna today depends on a variety of factors. Descriptions of the emperors only spoke of them being “clothed in imperial regalia” without exactly describing which items they were. The crown can only be dated back to the 13th century, when it is described in a medieval poem. The poem speaks of the Waise (i.e., The Orphan) stone, which was a big and prominent jewel on the front of the crown, probably a white opal with an exceptionally brilliant red fire and has since been replaced by a triangular blue sapphire. The first definite pictorial image of the crown can only be found later in a mural in the Karlstein Castle close to Prague. It is also difficult to define for how long the Imperial and Ceremonial Swords have belonged to the regalia. Emperor Sigismund transferred the Imperial Regalia "to everlasting preservation" to the Free Imperial City of Nuremberg with a dated document on 29 September 1423. They arrived there on 22 March in the next year from Plintenburg coming and were kept in the Heilig-Geist-Spital. They left this place regularly for the Heiltumsweisungen (English: observance orders, yearly on the fourteenth day after Good Friday) and for coronations. The last Emperor Francis II, dressed with the Imperial Insignia of the Holy Roman Empire. Since of the Age of Enlightenment at least the imperial regalia had no constitutive or confirming character for the empire any more. They were an only adorned decoration for the coronation of the emperors who all are derived from the House of Habsburg. The whole "rigmarole" around the coronation and the imperial regalia was felt mostly only as travesty. The young king, on the contrary, in his monstrous articles of dress, with the crown-jewels of Charlemagne, dragged himself along as if he had been in a disguise; so that he himself, looking at his father from time to time, could not refrain from laughing. The crown, which it had been necessary to line a great deal, stood out from his head like an overhanging roof. The dalmatica, the stole, well as they had been fitted and taken in by sewing, presented by no means an advantageous appearance. The sceptre and imperial orb excited some admiration; but one would, for the sake of a more princely effect, rather have seen a strong form, suited to the dress, invested and adorned with it. While French troops were advancing in 1794 in the direction of Aachen, the pieces located there were spent in the Capuchin's monastery to Paderborn. In July 1796 French troops crossed the Rhine and shortly after reached Franconia. 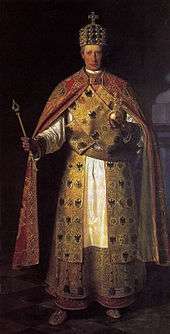 On 23 July a part of the Imperial Regalia (crown, sceptre, orb, eight pieces of the vestments) were transported by Nuremberg colonel Johann Georg Haller von Hallerstein from Nuremberg to Regensburg, where they arrived on the next day. 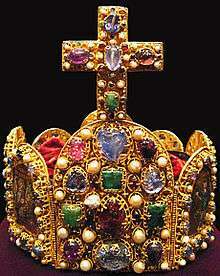 On 28 September the remaining parts of the jewels were also delivered to Regensburg. Since this elopement parts of the treasure are missing. Until 1800 the Imperial Regalia remained in the St. Emmeram Castle in Regensburg, from where on 30 June their transfer began to Vienna. There the committal is verified for 29 October. The pieces from Aachen were brought in 1798 to Hildesheim and reached Vienna not before 1801. After the Anschluss of Austria to the Nazi Reich in 1938 the imperial regalia were returned on instruction by Adolf Hitler to Nuremberg, where they were exhibited in the Katharinenkirche. In the Second World War they were stored for protection from air raids in the Historischer Kunstbunker (English: historical art bunker) beneath Nuremberg Castle. 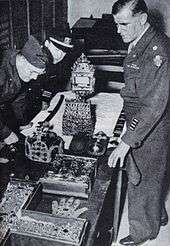 In 1945 the imperial regalia were found there by US soldiers and were brought back in 1946 to the Hofburg in Vienna. Fillitz, Hermann. Die Insignien und Kleinodien des Heiligen Römischen Reiches, 1954. The Holy Roman Empire, Reconsidered. Vol 1. Jason Philip Coy, Benjamin Marschke, David Warren Sabean (Spektrum: Publications of the German Studies Association ed.). Berghahn Books. 2013. ISBN 978-1-7823-8090-0. OCLC 872619479. Retrieved 13 Apr 2014. ↑ Rihoko Ueno (11 Apr 2014). "Recovering Gold and Regalia: a Monuments Man investigates". Archives of American Art. Washington, DC: Smithsonian Institution. Retrieved 13 Apr 2014. Wikimedia Commons has media related to Imperial Regalia of the Holy Roman Empire. This page incorporates content from de:Reichskleinodien, a page hosted on another Wikimedia Foundation project. Please consult the history of the original page to see a list of its authors.